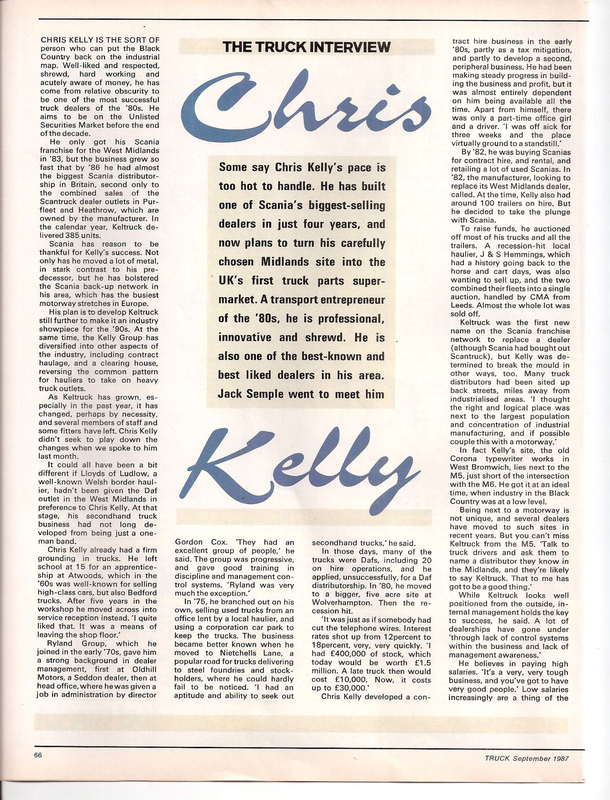 CHRIS KELLY IS THE SORT OF person who can put the Black Country back on the industrial map. 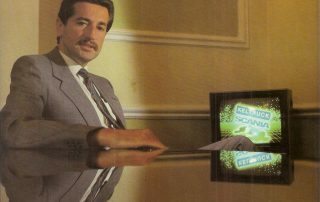 Well-liked and respected, shrewd, hard working and acutely aware of money, he has come from relative obscurity to be one of the most successful truck dealers of the ’80s. He aims to be on the Unlisted Securities Market before the end of the decade. 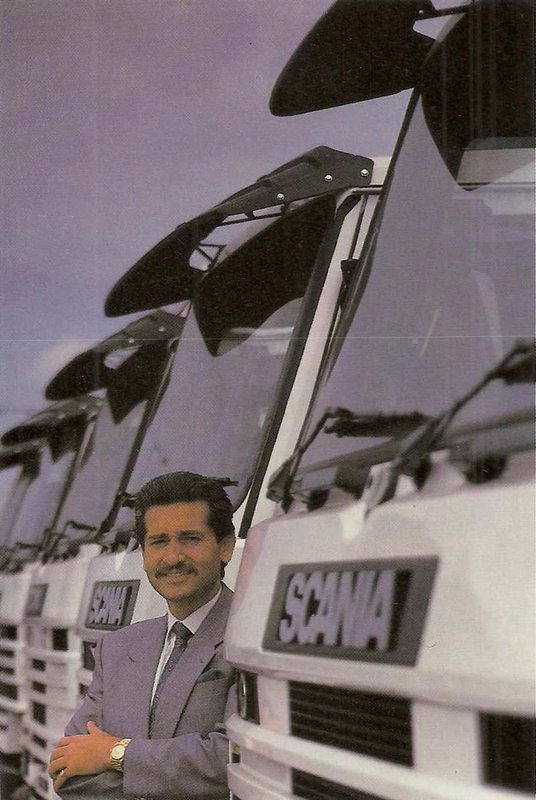 He only got his Scania franchise for the West Midlands in ’83, but the business grew so fast that by ’86 he had almost the biggest Scania distributorship in Britain, second only to the combined sales of the Scantruck dealer outlets in Purfleet and Heathrow, which are owned by the manufacturer. In the calendar year, Keltruck delivered 385 units. Scania has reason to be thankful for Kelly’s success. Not only has he moved a lot of metal, in stark contrast to his predecessor, but he has bolstered the Scania back-up network in his area, which has the busiest motorway stretches in Europe. His plan is to develop Keltruck still further to make it an industry showpiece for the ’90s. 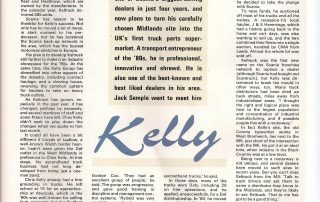 At the same time, the Kelly Group has diversified into other aspects of the industry, including contract haulage, and a clearing house, reversing the common pattern for hauliers to take on heavy truck outlets. As Keltruck has grown, especially in the past year, it has changed, perhaps by necessity. and several members of staff and some fitters have left. Chris Kelly didn’t seek to play down the changes when we spoke to him last month. It could all have been a bit different if Lloyds of Ludlow, a well-known Welsh border haulier, hadn’t been given the Daf outlet in the West Midlands in preference to Chris Kelly. At that stage, his secondhand truck business had not long developed from being just a one-man band. 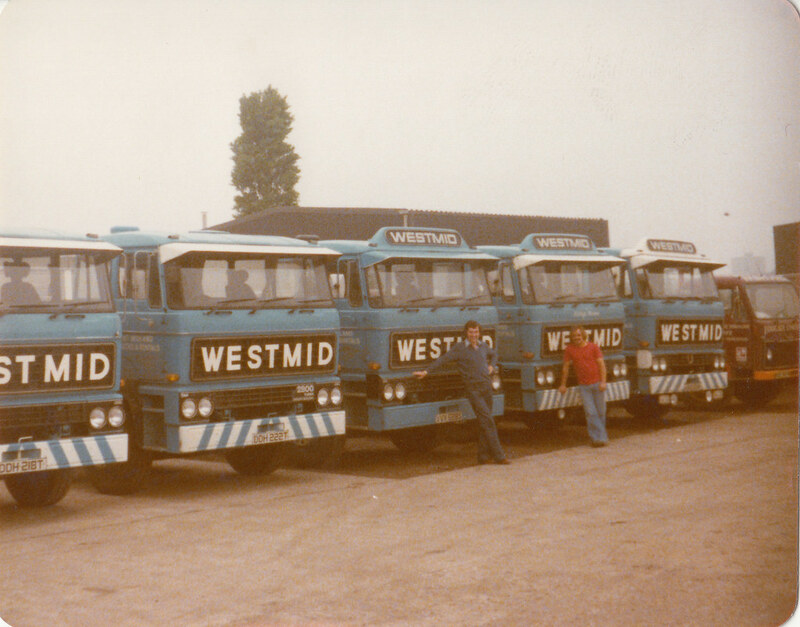 In ’75, he branched out on his own, selling used trucks from an office lent by a local haulier, and using a corporation car park to keep the trucks. The business became better known when he moved to Neachells Lane, a popular road for trucks delivering to steel foundries and stockholders, where he could hardly fail to be noticed. ‘I had an aptitude and ability to seek out secondhand trucks,’ he said. In those days, many of the trucks were Dafs, including 20 on hire operations, and he applied, unsuccessfully, for a Daf distributorship. In ’80, he moved to a bigger, five acre site at Wolverhampton. Then the recession hit. 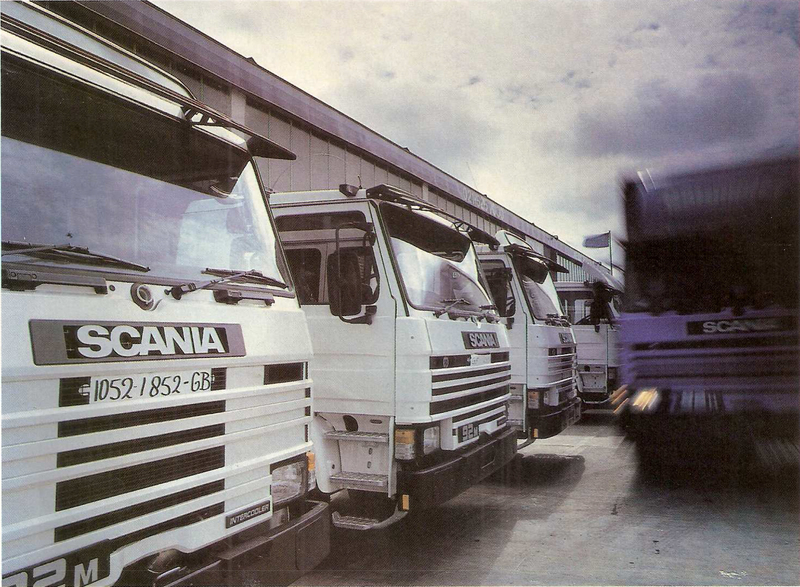 By ’82, he was buying Scanias for contract hire, and rental, and retailing a lot of used Scanias. 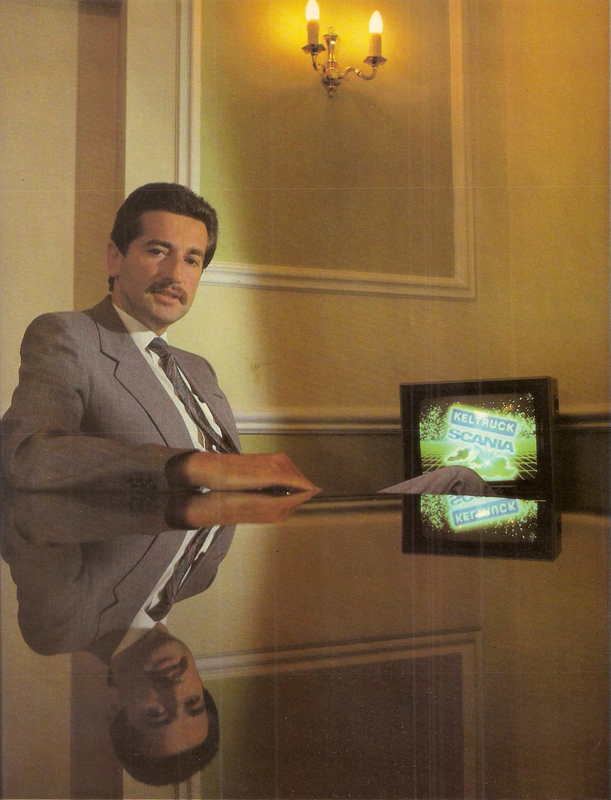 In ’82, the manufacturer, looking to replace its West Midlands dealer, called. 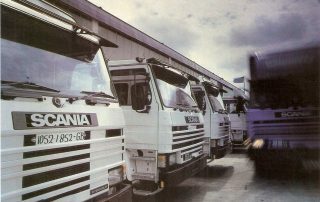 At the time, Kelly also had around 100 trailers on hire. But he decided to take the plunge with Scania. To raise funds. he auctioned off most of his trucks and all the trailers. A recession-hit local haulier, J & S Hemmings, which had a history going back to the horse and cart days, was also wanting to sell up, and the two combined their fleets into a single auction, handled by CMA from Leeds. Almost the whole lot was sold off. In fact Kelly’s site, the old Corona typewriter works in West Bromwich, lies next to the M5, just short of the intersection with the M6. He got it at an ideal time, when industry in the Black Country was at a low level. He believes in paying high salaries. ‘It’s a very, very tough business, and you’ve got to have very good people.’ Low salaries increasingly are a thing of the past now, he said. That’s not to say they don’t work for their money. Kelly is an entrepreneur who gives it all he’s got, and he demands a lot from his staff. And he stated that he is not the sort of managing director of a company who allows a man to stay in a job if he’s not performing as required. Within the company, Kelly has used the Industrial Society in recent months as part of a programme aimed at building a management team. The IS was recommended by Kelly’s brother-in-law, who is company secretary with a large group. Late last year he had the whole management team, including wives and children, at a weekend course organised by the IS, at a big West Midlands hotel. ‘It gave the wives more of an appreciation of the hours people have to work in this industry. The team does not look the same as it did last year, as at least three managers have left the group, to join or set up a new company. Without being drawn on individual cases, Kelly acknowledges the departures. The changes are a consequence of moving from a smaller company to a larger firm. he said. In the workshop it is no longer possible for customers simply to wander in and chat to individual fitters, which some customers had been used to, but which is impracticable in a large workshop. Tools tend to go ·missing, too, he added. Kelly has adopted much of the current thinking on fitters. Not all are realistically able to be trained to do every job on a truck, and that should be recognised, he said. Changes in the workshop are aimed at making it more efficient. It’s more formal, certainly, but should also prove more flexible and reliable for the truck operator. The belt and braces approach is now clearly out at Keltruck, if it was ever in. Kelly wages war on clutter, and demands clarity at all times. In the workshop he has three men employed solely to keep the place clean and tidy. Trucks parked at the dealership ready to go out to customers are parked in immaculate rows, on Kelly’s insistence. But it is his office which most clearly shows the Chris Kelly style. Sited at an extreme corner of the main building, the room housed the water storage tank in the days when the place was a typewriter factory with a sprinkler system to put out fires. ‘In this trade there’s a lot of good upside-down readers’, he quipped. If anyone comes in to see him, they meet over a businesslike table, although there are leather armchairs, too. A couple of impressionist prints by Lavery are on the wall. They’re Roger Stevens’ taste,’ (group marketing manager) he said. Kelly plans to· put in similar work stations for his managers. ‘It’s the trend at the minute, but I think it’s very good.’ It gives people peace to concentrate on the job, he said. Kelly’s next development at West Bromwich will be a major redevelopment of the site, which will bring the supermarket concept to the UK truck industry, by the end of ’88. There will be a complete range of t ruck maintenance and repair services on site, with facilities for drivers collecting, delivering, or waiting for a truck. But most innovative of all, will be a parts ‘supermarket’, where customers will literally be able to pick parts off shelves. Keltruck aims not only to have a full Scania range, but trailer parts, and other components and accessories. He won’t be following the Multipart line, though, and offering parts for Scania’s competitor marques. Before that, Keltruck will open an out let in Stoke-on-Trent, to compete with other heavy truck dealers in the area. The site will be open by the end of the year, he said. The Ashridge courses help to give a vision of where the industry is going, and where a dealer’s business can fit in to it, Kelly said. He’ll take the group onto the USM to enjoy the benefits he’s worked for, and to raise cash to expand the business both internally and through acquisition. So Kelly will be keeping an eye out for business opportunities associated with trucks. Tm not into property.’ Business development has already taken him back into contract haulage, which he said has been a natural progression from truck contract hire, and which in turn was developed from truck retailing. 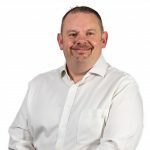 He has bought several haulage firms, in one case to turn round a traditional general haulage operation running older lorries to a new, streamlined firm, working on contract. ‘I like the word contract,’ he said, ‘it’s got some future to it. It means the work isn’t here today, gone tomorrow. ‘The traditional market for purchasing of trucks is declining substantially,’ he said. Operators are increasingly looking for fixed prices. A new breed of businessman is coming into haulage, and looking carefully at the cost of use of trucks. Trucks in future will be used more intensively than they have been, and they’ll be cut up earlier, to avoid expensive breakdowns. Kelly has changed his views on extensive rebuilding of trucks, which has been given a boost by tax changes. The practice is common in the States, under the ‘glider kit’ system. ‘I now believe that people haven’t got the time,’ he said. But it could vary from one part of the country to another. There’s a lot of truck expertise available in Yorkshire and Lancashire at reasonable cost, for example. Kelly’s biggest problem this year has been a shortage of trucks to sell, both second-hand and new. ‘We’re sold through now until September production,’ he winced, talking to us in early July. One area Kelly is not at all keen to attack again is spot rental of trailers. They’re too much trouble. There’s too much potential accident damage, unless they’re on contract hire. And the trailers can go through a £1400 set of tyres in anything from six months to 12 months.’ Also, tri-axle trailers rip off tyres much more than on tandem trailers. Fortunately, he got blown against the wall right beside a tap, and was able to wash out his eyes. Scotland has also made Chris Kelly teetotal. He admits, over a Perrier water, to once having bought a few rust buckets on the strength of some stiff whiskies at Glasgow airport. Kelly’s pace has been hectic. So much so that he’s ‘only had time’ to drive 500miles in one of his prized possessions, a 4.2 E-type roadster that’s done only 20,000miles (true). 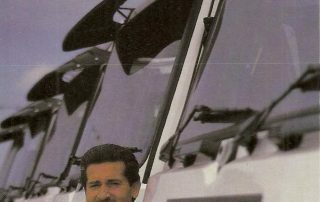 He has built not only one of the most successful dealerships of the decade, but done so without the backing of one of the large groups which own so many truck outlets. No longer a one-man-band, he is now boss of a multi-million business which has changed in character since it was set up just a few years ago. Not everyone agrees with or likes the changes at present. But Kelly is driving the business with commitment and imagination, and most people in the Midlands want to see him succeed.